Undergraduate interns from Cornell’s New York State Agricultural Experiment Station in Geneva, New York visited Cornell yesterday to explore the campus, meet with faculty, and to learn about the graduate program. 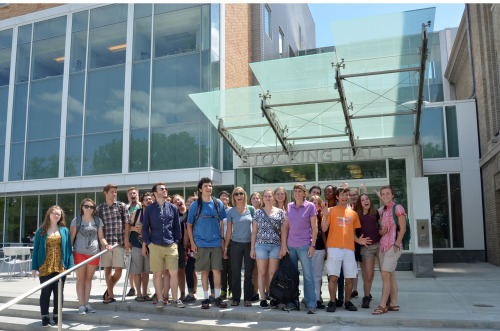 Over the summer students have the opportunity to gain research experience while working with faculty, graduate students, postdocs, and staff at in Geneva to discover more about fungi, apples, beetles, and so much more. While at Cornell the interns sat down with Bill Miller, the Director of Graduate Studies for the School of Integrative Plant Science, and Stewart Gray of Plant Pathology for an interactive discussion and an opportunity to ask questions. The most asked question was how to get into graduate school, and both Miller and Gray explained that research experience is vital, and since the students are interning in Geneva, they are on the right track. Gray said they “are looking for a breadth of experiences and skills” in potential graduate students. Some students wondered what the path would be like after they earned a graduate degree and the faculty explained that many go into academia, but some also go into industry and government research, consulting, and extension among other fields. After this talk, the students met with entomology Department Chair, Laura Harrington and Bryan Danforth, professor of entomology, for an interactive discussion surrounding similar topics. The students finished the day with a tour of Cornell’s campus, and an obligatory stop at the Dairy Bar for ice cream before heading off to Geneva, where they will continue working hard before (hopefully) coming back to Cornell for grad school.